This is the first time I have had a cousin’s DNA test come out showing an ancestry composition that was 100% a single ethnicity. My cousin J.M. 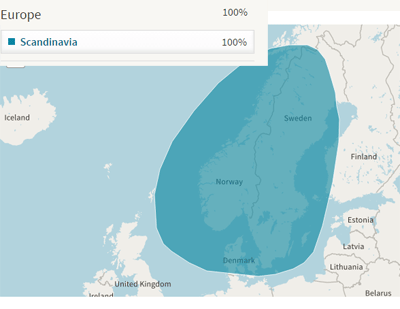 was not in the least bit surprised as she expected to be all Scandinavian. Five of her eight great-grandparents were born in Norway and the other three were born in the U.S.A. to Norwegian immigrants. But I was quite surprised because there is usually at least a trace of something else. She shares my Norwegian born Munson (Monsen) great-grandparents as her great-great-grandparents making us 2nd cousins once removed. She tested at AncestryDNA to help me figure out where a related adoptee might fit in (no luck on that). The fact that she has a genetic genealogist for a cousin who would tell her what it all meant helped convince her as well. I usually send cousins to my page comparing all the autosomal tests and let them choose. However I prefer Ancestry.com DNA testing for the interested, but non-genealogically serious, relatives who are online because it is so easy to see the relationships and use the green leaf hinting system. Also I was tired of having only one circle and her test would give me a second one. Those with colonial ancestry have plenty of circles and NADs (New Ancestor Discoveries) but we recent immigrants (1870s and 1880s) are lucky to have any. Last but not least, it was the cheapest test at the time she ordered it. Now why is she perfect? It is not just the 100% Scandinavian but amazingly her top four matches are all second cousins from different pairs of great-grandparents! I have never seen that before either. Of course most of my tested relatives being from relatively recent immigrants, have no second cousins and almost no thirds showing at Ancestry . As you can see from the green leaves, ancestry found the relationships for three out of four of those top matches. Her best match, jt, is a second cousin on her Sveen line and they are now happily messaging back and forth. Her next match, D, is a third cousin of mine whose test I manage and he is J.M.’s known second cousin on the Munson line. Thanks to me they have been in touch for a while. The best third cousin match with the small 45 person tree turned out to be a second cousin on the Thompson line. 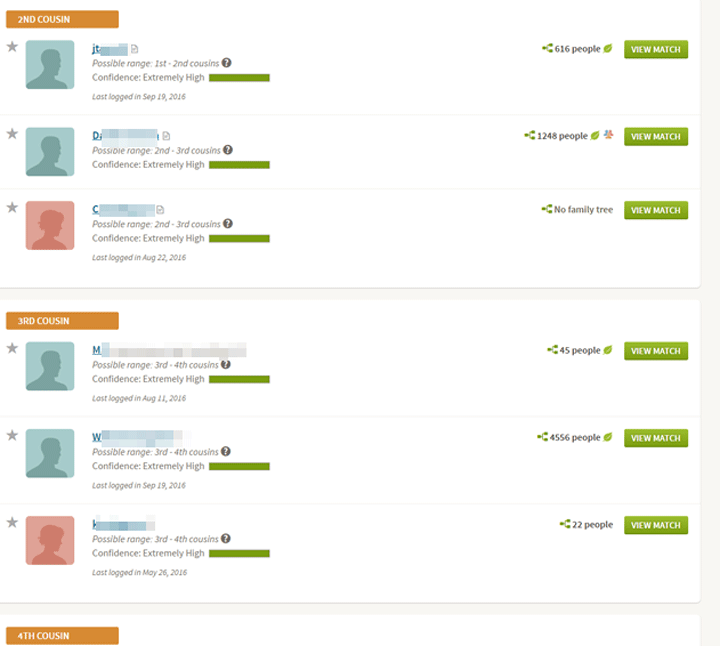 Interestingly the ancestry matchup shown below only finds their common great-grandfather because J.M.’s cousin used the married name for his wife in her tree while we have her maiden name in our tree. Often for those of us Norwegians with widely varying spellings, ancestry will miss one half of the match or put it generation further back so it is always good to look at the matchup carefully. The lowest second cousin match, C., did not have her tree connected to her DNA test but when I clicked on the view match button, I discovered she had a tree that was not connected to her DNA test (see below, red arrow is my addition) so I selected it. The tree showed a home person with the same name as the match name and I immediately saw J.M.’s Nelson great-grandparents on this tree, so yet another second cousin. I wish things were this easy with some of my other cousins! Over the next several days, I worked down through J.M.’s third cousins and best fourth cousins and discovered that many really do share great-great-grandparents with her, but either due to spelling issues or trees not connected they did not have green leaves. I decided to use red check marks on an image of her tree to show which lines are proven with DNA thanks to Michelle Trostler’s tip (she used stars) discussed in a previous post. 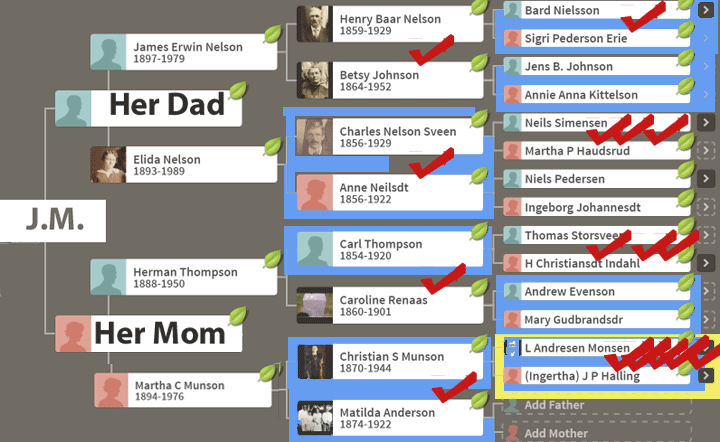 I also outlined in blue all the ones born in Norway and added a yellow highlight for our shared ancestors. Here is the result so far. I suppose you are noticing the blank parents for Matilda (Mathilde in Norway). Sadly a very common name but when I am next in NYC, I will get their marriage certificate from the municipal archives which will hopefully have her parents’ names. Of course I uploaded J.M.’s results to GEDmatch. WOW the new generic upload was amazingly fast. It took less time to process (2 minutes) than to upload! Next to add her to DNA.land whose ancestry composition I like the best. So perhaps a future post will look at some of those more ancient ancestral traces found at those two sites. Thank you my perfect cousin for testing and giving me your data! Are you sure that Christian & Matilda were married in NYC? I looked on familysearch (they’ve indexed those marriages including parents’ names) and couldn’t find them. I also searched using Steve Morse’s site. I have one cousin who’s 100% Ashkenazic so is also perfect. Most of the others are in the high 99% range. Lara, thank you for that! I will be in NYC in December so I will see if I can find it then. I too came back with a 100% result. Six of my great-grandparents are from Portugal. My biological full sister is wildly different than mine, 45% British Isles, 3% near East, 1% West Africa, 51% Southern European. Her origins are a closer match to our paper trail than mine. Truly makes a case for testing all possible siblings. Of our 600+ matches each, we have over 300 matches, nearly half, “not in common” at FTDNA. I wonder if this is typical? Carole- siblings can vary a lot by getting different bits from their grandparents. My brother has 21% ashkenazi from our maternal grandad while I got 28%! However with such different results from your sister have you double checked that you are full sibs by comparing your kits at GEDmatch? I used 1 to 1 match on GEDmatch. Is there another tool I should be using? 675622 SNPs used for this comparison. FTDNA designates us as full siblings. Just checked. We have lots of green and 2,451 cM’s. Kitty. Did u get my off geni note that we match at my geni’s parent company (m.h) as 3rd cousin?